A leaked benchmark of Ashes of the Singularity supposedly shows metrics for the upcoming Intel Core i9-9900K. Compared to the current Intel Core i7-8700K, the 9900K offers marginal improvement. In heavy CPU workloads, the 9900K is noticeably better, but if the leak is legitimate, the CPU may not warrant an upgrade. We will of course release our own benchmarks when the CPU is released next year. Intel’s 9th generation Coffee Lake-S CPUs are just around the corner, scheduled to trickle out over the first half of 2019. While Coffee Lake brought major improvements to Intel’s consumer CPUs, Coffee Lake-S looks to be a modest refinement of the current chips.Thanks to a possible benchmark leak by Twitter user APISAK, we may have a clearer picture of what to expect from Intel’s 9th gen behemoth, the Core i9-9900K, and it isn’t very exciting. APISAK posted two screenshots of the built-in benchmark for Ashes of the Singularity, a strategy title from 2016. While the game is older, it’s fairly CPU-reliant (as most RTS games are). An important note is that the benchmark delineates total performance from CPU performance, denoted as a “CPU Framerate”. 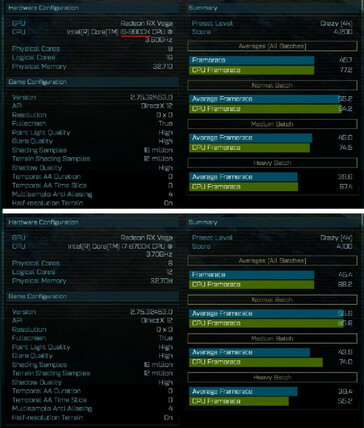 The two screenshots in question were of the Intel Core i9-9900K and the Intel Core i7-8700K. 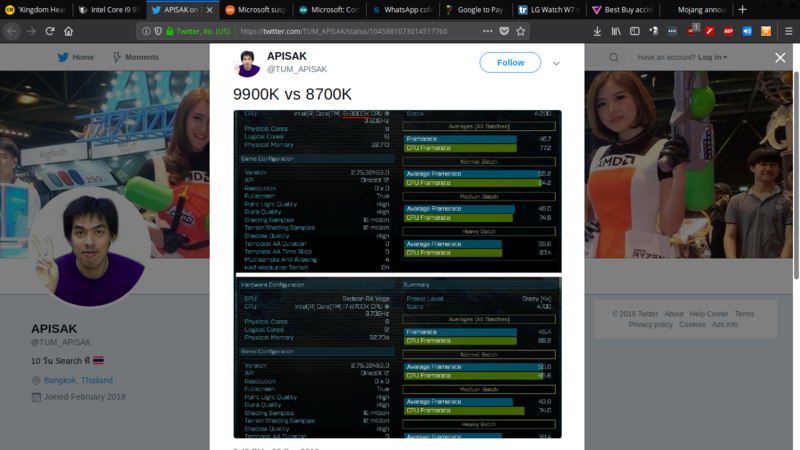 Comparing the metrics, the 9900K is a fair bit more powerful than the 8700K, as is to be expected. After all, the 9900K boasts 8 cores (16 threads) compared to the 8700K’s 6 cores (12 threads). That said, the numbers don’t quite reflect the expected performance gains. Overall, the 9900K scored about 8.58% better than the 8700K. Where the 9900K really shines is heavy CPU load, beating the 8700K by 22% in the Heavy Batch. There are, of course, several factors to consider in these benchmarks. For one, the GPU (listed simply as a Vega GPU) could be bottlenecking the CPU. 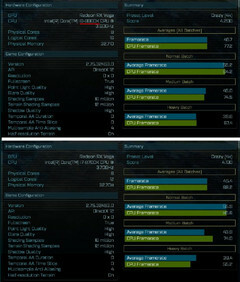 Also, if this benchmark is legitimate, the 9900K used is almost certainly an engineering sample. Engineering samples are notorious for performing noticeably worse than the consumer release. The benchmarked system BIOS is also unlikely to fully support the 9900K, which would further inhibit performance. All said, this benchmark leak is currently the best guess we have at how well the Core i9-9900K will fare when it’s finally released next year but should be taken with a large grain of salt. As it stands now, it may not be worth the purchase price for those running a Core i7-8700K, but we’ll reserve our final judgement as more information is made available. Of course we will benchmark the CPU as soon as we get our hands on it.